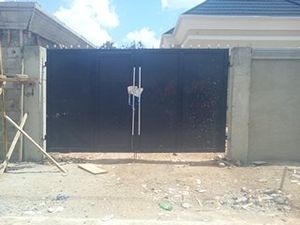 Ekiti government seals off house allegedly belonging to Fayose. Two buildings in Ado Ekiti linked to the immediate past Governor of Ekiti State, Ayodele Fayose, have been sealed off by the state government for lack of approved plan and permits. The state government, through the Ministry of Housing and Physical Planning and Urban Development, said the erection of the buildings contravened the laws guiding urban renewal regulations. Fayose is currently being tried at the Federal High Court, Lagos, by the Economic and Financial Crimes Commission (EFCC) over alleged reception of N2.99 billion from the office of the former National Security Adviser, Sambo Dasuki, to fund his re-election in 2014. The sprawling twin duplexes with elevated fences, covering over six plots, were located at the Government Reservation Area (GRA) in Ado Ekiti and almost adjacent the new Deputy Governor’s lodge located within the Government House. When journalists visited the building on Friday, the gates were locked while contractors working on the buildings had deserted the place. A paper dated October 18, which was attached to the gate and signed by the Director of Urban and Regional Planning in the Ministry said: “It was discovered during inspection by the inspectorate staff of our ministry that a residential building by you at GRA has no approved plan/permit for the site or bring same to our office to get certification for the erection. “You are hereby ordered to suspend the use of the building premises until approved plan is submitted for clearance,” it stated. Before Fayose exited office, rumours had been rife that he was the owner of the magnificent buildings. In his response, Fayose accused Fayemi of embarking on vindictive action over an issue that isn't worth government’s attention. “He should hurry up to do all he could for the benefit of common Ekiti people because time is not on his side,” Fayose advised.